It’s been a busy few weeks for the MUHOS coves, what with all those icons of the golden age of Stornowegian telly going to the great Studio Alba in the sky. Hot on the heels of Roger Smùir and Peter Salach, we’re sad to announce the demise of Amadan Westview, the star of Grampian TV’s classic 60s series ‘Backman’. ‘Backman’ ran for two seasons on Grampian, the first big-budget production for the Gaelic Department of the Aberdeen broadcaster. (Although filmed in Gaelic in order to qualify for a grant, pennypinching Grampian bosses also tried to squeeze a few mair bawbees oot o’ it by dubbing it into Doric very cheaply and recycling it for their East Coast viewers. ‘Flichtermooseloon’, wi’ a’ the voices spak by yon J*mmy Spankie mannie aff ‘Top Club’, was apparently a big hit in the Rothienorman area, ye ken). 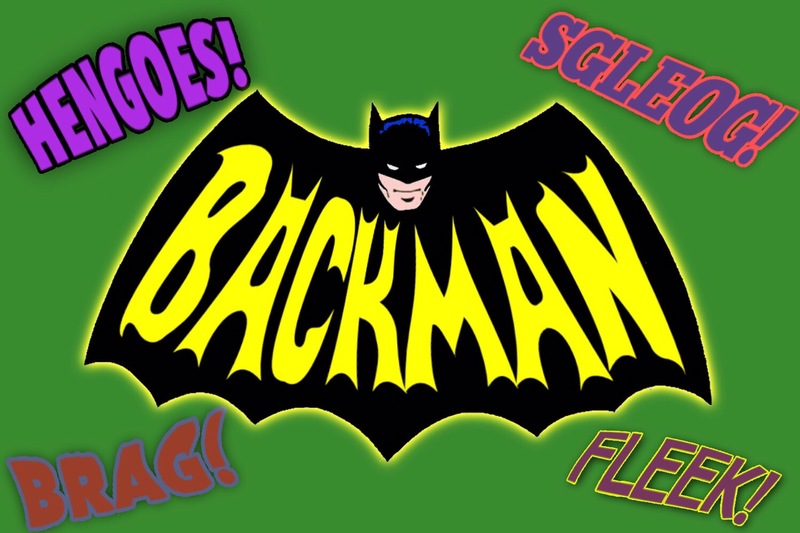 ‘Backman’ revolved around the exploits of billionaire businessman Bru Swainbost, and his alter ego, Backman, fighting crime in the fictional metropolis of Gothill City. The show was famed for its camp production values, shaky sets, and the famous fight scenes in which comic-book sound effects like “SGLOG! !”, “OBH! !”, “FLEEK! !”, “BRAG!! !”, “HENGOES! !” and “MO CHREACH ‘S A THANAIG! !” would appear on screen. It was also infamous for the “quality” of the acting – which contained more ham than the fleekeen cold meat counter in Hugh Matheson’s. The story was that Backman had become a secret crimefighter because of a traumatic experience he’d had as a child in the lawless and gangster-ridden 1930s, when somebody nicked a whole bucket of peats out of his parents’ cruach. Swearing revenge on criminals everywhere (especially peat thieves) Backman created a secret base beneath his mansion, Swainbost Manorpark. Together with his trusty butler Alexdanfred, Backman developed an array of crime-busting vehicles, gizmos and gadgets – from the Backmobile to the Backbike, the Backtairsgear, the Backcroman, the Backtractor and the Backmitchellsbus. Backman was ably assisted by his ageing, forgetful and occasionally incontinent assistant Tick Gress-son, aka “Ropach, the Bodach Wanderer”. Many viewers were rather suspicious of the pair’s domestic arrangements and the age difference between them, but for the purposes of the series this was all explained away by the premise that Backman was Ropach’s “carer”. The back-story was supposedly that one-time Coulegrein House resident Ropach had wandered out of the day room one afternoon and joined a queue of sheep at the old slaughterhouse, convinced that it was 1928 and the mehhhags were his old drinking pals lining up to catch the last bus home to Tolsta. Backman happened to be passing when Ropach reached the front of the queue, and rescued him just as he was about to be dispatched by the slaughterman. A grateful Ropach decided to run away from Coulegrein, move into Backman’s mansion, and join the Caped Cruach-saver’s crime-fighting enterprise full time. Every episode, one of Gothill City’s regular supervillains would get up to some sort of bleigeardry that was beyond the wit of the Gothill City Police Department to handle, so Commissioner Gordond**sel and Chief O’Heeyarrrna would get on the Backphone to summon assistance from our hero. However, the Backphone would usually be fleeked due to faults in the area, so they’d fire up the Backsignal instead – a powerful searchlight emitting a beam visible for miles around (unless it was daytime). Surprising though it may seem, few Bacachs today are aware that this is how the village’s Lighthill district got its name. The Smoker – A villainous grinning master-crook with his secret hideout in a kippering shed on Newton. Fortunately for Backman, the Smoker was dead easy to catch because of the distinctive kipper-y smell that he left everywhere. The Smoker was played with relish by the great actor DonnieCesar Rubhamero. The Puffin (played by Barvas Murdoditch) – A fat bleigeard with a big beak, a secret base on the Shiants and a taste for sand eels that usually lead to his downfall. The Riddler – Played by Fank Gartan (a cousin of Tick Gress-son), The Riddler was a notorious Gothill City worthy who terrorised the populace by drinking in the municipal toilets but never using them for the purpose intended. Instead, the Riddler preferred to answer the call of nature in ‘unusual’ locations then send cryptic clues to the Gothill City Cleansing Department as to where he might have done his business. (It was almost invariably the same phone box in Perceval Square). Hatwoman (Played initially by Julie Newmarket, then by husky Hearach chanteuse Urgha Kitt) was the terror of Gothill City’s churches on Sabbaths and Òrduighean days, swooping in, stealing hats off the cailleachs’ heads, and disappearing back to her fictional secret base under Tiumpan Head before anybody realised what had happened. During the week Hatwoman’s alter-ego, Selina Kylescalpay, operated an exclusive milliner’s shop from the fictional lighthouse buildings, flogging all the hats she’d nicked on Sunday back to the cailleachs again. Due to persistent misprints of her ads in the Gazette, however, people kept turning up to leave their moggies at the ‘Tiumpan Head Hattery’ while they went on holiday. Initially this led to a roaring trade in Davy-Crockett-style winter chapeaux, but eventually suspicions were aroused by a host of complaints from returning holidaymakers who’d been told that their beloved Tiddles or Fraochan had ‘run away’, only to spot them on some cailleach’s head the next time they went out to the prayer meeting. Feeling the pressure but also spotting a legitimate business opportunity, Hatwoman eventually went straight, winding up the headgear-related side of her empire to concentrate on pet care full time. And who can forget the Backman theme music which went on to gain cult status?